Model: The signal has a gray mast and a movable disk. 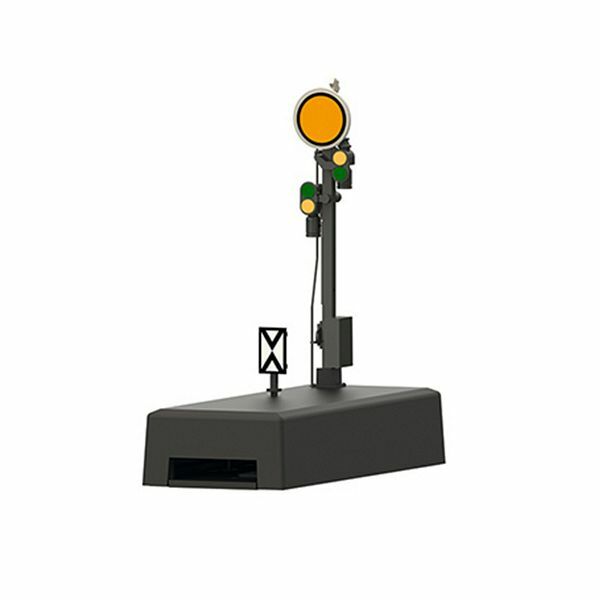 The signal changes from yellow/yellow (Vr 0) to green/green (Vr 1). Stop-and-Go on the Rails. Just like the real life prototype, signals fulfill important control and safety functions on a model railroad too. Märklin signals control rail traffic, because they not only show prototypical signal aspects, they also directly influence train movements. When set for stop, they switch the current off in the center conductor and the catenary in their area – the train remains stopped. For "go slow" or "go normally" they switch the current on – the train runs through or starts up again. If you want to be even more realistic, you set up distant signals at an appropriate distance. They are coupled to their home signals and display appropriate signal aspects. Semaphore/target signals can be controlled conventionally using the 72760 control box and in the digital system using the CS III+, CS III, CS II, MS II, CS I, or the 6040 Keyboard. These newly designed semaphore/target signals have the mfx, Motorola, and DCC digital formats. The mechanisms for these signals are servo drives. The speed of the semaphore / target movement can be programmed. The constant light source is done with LEDs. A below-baseboard mounting kit is included to have the signals look realistic on your layout.